Activated cannabis compounds such as cannabinoids and terpenes contained in your selected edible are absorbed through your digestive tract, including your liver. 2What are the differences between smoking, eating and sublingual applications cannabis? Your method of ingestion will vary the onset time, length of the high and experience. Mode of Action: When a person smokes cannabis the cannabinoids are immediately absorbed into the blood, which flows directly to the brain. Mode of Action: Cannabis edibles are mostly absorbed through your digestive tract, including your liver. Most edibles take longer to onset, and also last longer. This will vary depending on the type of edible and your own body. Mode of Action: When placing cannabis sublingual preparations under the tongue or between the gums and the cheek, it is absorbed via the sublingual mucosa and moves directly to the blood, and then to the brain. 3 How long does it take to feel the effects of edibles? Most edibles onset between 15 min - 1.5 hours. Yes, this is a wide range of time! There are many variables to onset time including: what sort of edible you ingested and your own unique metabolism and endocannabinoid system. If you consume a hard candy you that dissolved in your mouth, activation time will be much quicker due to the sublingual absorption of cannabinoids. If you ate a cookie or a brownie, it will likely take longer, ranging from 30 minutes - 1.5 hours. Additionally, each person has a unique endocannabinoid system and metabolism which will impact both onset time and dosage required to experience a cannabis high. 4Will I get high if I consume raw cannabis? You will most likely not get high if you consume raw cannabis. There is only one exception to this rule I am aware of: if you juice fresh raw cannabis combined with citrus fruit, you may experience some sort of high. Citric Acid has the power to oxidize cannabis and therefore cause a redox reaction potentiating the THCA into THC. 5How can I be sure I don’t get too high when eating edibles? We always suggest starting small and working your dosage up to your desired experience. Remember you can always ingest more, but if you over do it, you can’t go back! The state has determined that 5mg of THC is a single dose for a recreational user. This can be misleading, as each person’s endocannabinoid system and body is going to process cannabis differently. If you are brand new to cannabis, we suggest you start small - perhaps with only 2.5mg. Another good trick if you are new to cannabis edibles is to make sure there is some CBD in your edibles. CBD will help reduce anxiety and create a well-balanced cannabis edible experience. 6What kind of cannabis products are used in edibles? The most commonly used cannabis products in edibles are extracts and concentrates. The most commonly used extracts include Butane Hash Oil (BHO) and Distillate. The most frequently used concentrates include Kief, Hash and Cannabis Butter. Raw cannabis contains only the carboxylic acid forms of cannabinoids. For example, in the raw cannabis plant there is no THC, only THCA is present. THCA while it has many health benefits, will not induce the high or euphoria of THC. In order to turn THCA into THC decarboxylation must happen. Time and temperature are the most common catalysts for decarboxylation. As cannabis flowers dry, decarboxylation occurs slowly. This process is accelerated by adding heat: the more heat you add, the faster the reaction takes place. When you smoke or vaporize cannabis you are rapidly decarboxylating your cannabis. Further, when you ingest edibles, the cannabis concentrate or extract used to make the edible has also been decarboxylated. 10What happens to my cannabis when it is being decarboxylated? When heating cannabis during the decarboxylation process, not only is THCA converted to THC, but THC is also converted into CBN. 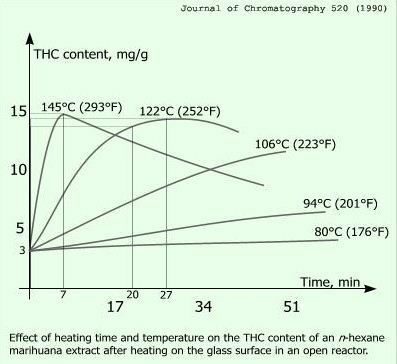 THC converts to CBN rapidly when heat is applied. CBN makes your cannabis more sedative. Therefore, optimal decarboxylation involves exposing your cannabis to a limited amount of heat over a specific amount of time to activate the most THC and minimize the amount of THC converted into CBN. Thankfully, there is a body of research that has been done to find just the right process. 11How do I Decarboxylate Cannabis at home to make my own edibles? 1. Grind up cannabis flowers and/or trim. 3. Preheat oven to 250 degrees. 12Is there any other way to decarboxylate cannabis? Citric acid can be used to make a citric acid extraction, where the citric acid decarboxylates the cannabis. See the link below for more information. 13What are the health benefits to juicing raw cannabis? When juicing raw cannabis a higher concentration of raw cannabinoid acids are available. This means that most people can consume more cannabinoids without the side effect or with a minimal side effect of getting high. All the health benefits associated with consuming cannabinoids apply to juicing raw cannabis. In addition to that, raw cannabis juice is also high in antioxidants and other vitamins and minerals. 14What part of the plant is best to juice? You can juice either the leaves or the fresh buds of the cannabis plant. If you use the fresh buds, cannabinoid levels will be much higher in your juice. Make sure if you use the fresh buds, and don’t desire a THC high that the buds are literally just picked off the plant, and that you do not use any citrus fruit in your juice. Conversely, if you desire a high from your juice, use buds and add them to citrus fruit. 15What is the best way to juice cannabis? In order to juice cannabis and not activate the cannabinoids you must use a masticating juicer.